I'm back with my third post on my NEESYA's product review. Yes, it's my third post about Neesya already! Read the previous post about Hydrating Serum here and my first review on the Intensive Overnight Radiance products here now! NEESYA's Brightening Eye Contour Gel is an eye treatment with fragrance free and color free, formulated in a 360° approach to address the major concern of the eye contour, such as dark eye circles, puffiness and fatigue and aging eyes. It's a gel with smooth texture and some sparkle in it! Regu®-Age PF is the main ingredient to counter the causes of dark circles, puffiness and improves skin firmness and hydration. This ingredient was studied by the Eye Care Clinical, which it's proven that it improves micro-circulation and blood flow to the eye contour area. The LumiScience® Technology in this eye gel helps to diminish discoloration around the eye area, protect against oxidative stress and refine the early signs of age. Something I have never heard before is this product contains light diffusers which helps to refract light for immediate optical brightening effect. I guess it's the sparkly glitters in the gel? Dispense 1 pump onto your fingers. (I normally only use half pump) With your fourth finger, gently pat Eye Contour Gel under the eye area, blending gently from inward to the outward corner, followed by application over the top of the eye lids. Then, smooth the product over the eye contour until it's fully absorbed. Apply twice daily, in the morning and night. TIP: For a refreshing experience for tired eyes, place product in the fridge and apply a generous layer like an overnight mask to soothe tired, puffy eyes. This was the instant effect during my first week of using it! Obviously you can't see this in my images above, but with my bare eyes, I saw the sparkles were spread around my eye area after applying, and I feel like having glitter eyes with it! As I mentioned at the beginning of the post, this is the best NEESYA product I've ever used! The sparkling effect on the gel is so magical! Furthermore, this gel doesn't have the typical Neesya product's smell like I mentioned in my previous Neesya's post. It's fragrance and color free so you don't need to expect for any nice or bad scent. 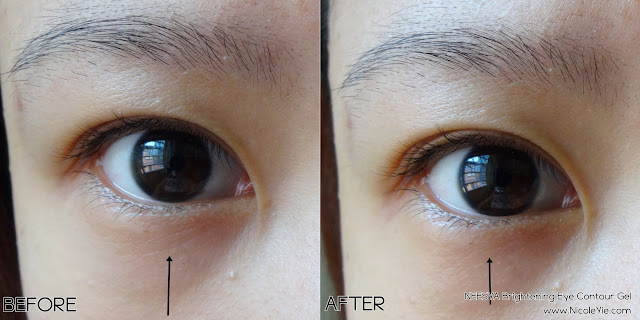 The best part is that it has a little bit of cooling sensation around my eye area after applying it, and the effect last for a few minutes. Every time after using it, I felt that my eyes has more energy and I can see things clearer, like really? Magic!